Recently, on one of the leading internet technical forums, a person posted a concern about a perceived engineering problem. Their concern was about the relative settlement between different objects that would effect the fit-up of the connecting pipes. This ¼” may sound like a lot. It would indeed be a lot if you were dealing with the fit-up of internal components in say, the watch on your wrist or your new Lap Top Computer. Let’s talk about the subject of settlement. Settlement is a fact of life for process plant projects, it is a reality. It is going to happen in 99% of all projects and it will affect piping fit-up. Geological settlement will not all happen the day of start-up but it will happen over a long period of time during construction and during the working life of the facility. That is a question you must ask the Civil Engineer on each project. Every type of soil in every different geographic location will have its own characteristics and problems. In every case I would say in the first five years there will be way more than a ¼” of differential settlement between objects of both major size and minor size at any Process Plant facility. Well maybe you get to work on a project that is built on solid rock that is very thick and spreads out under the whole site. It will probably not have the problem of differential settlement. But you will have all the other construction “tolerance realities” of any other project. Settlement is not the only problem and a quarter of an inch is not a lot (vertically or horizontally) when you are dealing with the real world of a major Engineering and Construction project. Everything that goes into such a project will have a tolerance applied to it in every axis. The Fabrication of all the equipment and structural elements listed above are affected by vertical, horizontal and angularity “tolerance realities”. Positioning in the field of all the equipment and structural elements listed above are also effected vertically (including settlement), horizontally, angularity by the reality of construction “tolerance realities” both in the locating and the assembly. Another word for “tolerance realities” is “Margin of error”. Margin of Error is a term that is commonly used. It can also relate to “Tolerance” in fabrication or other work related issues. In the Engineering, Design, Fabrication and Construction of a complex process plant there are many facets. All of these facets have their own margin of error. Some are very small because of good standards, strict controls and extensive quality assurance. Others however, do not have good standards, are not so well controlled and do not have the required quality assurance programs to back them up. When building a process plant there are many facets affecting fit-up including the Ground it is built on. Next there are the Foundations. Then there is the equipment; the Pumps and Compressors; the Exchangers; the Vessels and the Tanks. Along with all the equipment there are the support components such as Multi Level Structures and Pipe Racks. Then you have the Piping that connects it all together. All of this is impacted by the final facet called “human error” which is unpredictable. Last of all there is “Nature” itself. In the engineering and design office all the groups work to pretty much the same level of detail, the same measurement and the same expectation of quality. However, when all the drawings go out in all directions to the manufacturers or fabricators the margin of error increases and the level of quality will suffer. Worst yet, at the job site the system breaks down more because of circumstances that are beyond the designers control. Each of the facets listed above has their own “standards” of quality. Some of these quality standards are better than others. None of them are perfect. Some facets do not seem to have any standard at all for final installation in the field. My area is piping. 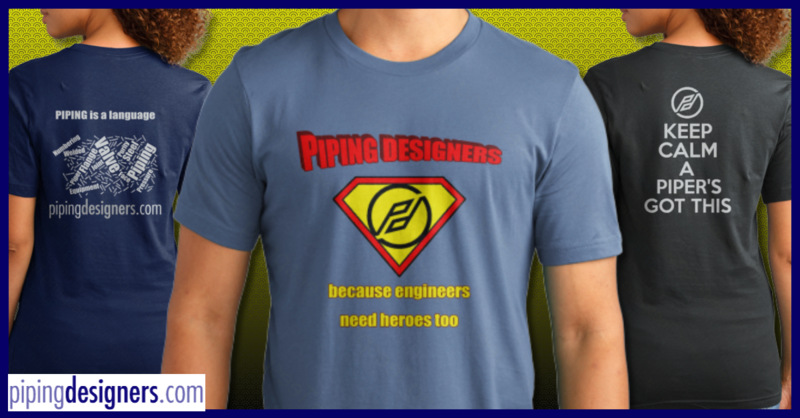 I spent many years in the design office as a piping Designer and piping Supervision. I had time in the Pipe Fabrication Shop as the Engineering manager. Later I also had time at the jobsite as a Piping Field Engineer. Over these many years (45) I saw and heard about many situations where things did not go right and in every case the Piper got the blame. Please let me relate to you just three of them. Project “X” – A multi-level structure supporting an Exchanger on Level 3. Next to the structure is a grade mounted vertical vessel. Connecting these two is a 10” pipe that attaches to the outlet nozzle on the bottom of the exchanger and drops through the platform under the exchanger; exits the structure and then drop to the level of the vessel nozzle and elbows into the nozzle then connect to the vessel with a bolted flange connection. The exchanger, the exchanger nozzle, the hole in the platform, the 10 foot diameter vertical Vessel and the vessel nozzle were all on the same (true North/South) center line on all the design documents from the office. In the field the pipe missed the vessel nozzle by 1-1/2”. That is twelve times the allowable piping fit-up tolerance. Piping was initially blamed for bad design and bad quality. A proper survey was initiated post-mortem and the results showed that a) the vessel foundation was out of place (surveyor error), b) the structure was not plumb (no standard for vertical alignment), c) the vessel nozzle which was supposed to be on the North/South center line, was off by 1 degree with a nozzle projection of 5’-8”, d) The piping was within the design accuracy allowance and the PFI (Pipe Fabrication Institute) ES3 tolerance standards of +/- 1/8”. Piping got blamed anyway. A four story structure with a close fit vertical pipe chase. On installation the pipes down on the first level were hitting the steel beams. The post-mortem showed that the structure was out of plumb by 6” from grade level to the roof beams. Piping got blamed anyway. A twenty foot (20’-0”) wide central pipe rack between two rows of identical Reactor Vessels. The design documents (Plot Plan, Foundation Location Drawing, and Piping Plans) all have the center line of the vessels 20”-0” from the near centerline of the pipe rack columns on each side. So then, the plan shows a row of vessels, then 20’ to the center of the pipe support column, then 20’ to the next pipe support column, finally 20’ to the next row of Vessels. When the pipe installation was started in this area, the field reported that design “had screwed up again.” All the pipes connecting to the vessels on one side of the pipe rack were 1’-0” too short and all the piping connecting to the vessels on the other side of the rack were 1’-0” too long. The post-mortem survey showed that the Surveyor had located the pipe rack 1’-0” out of place. Piping got blamed anyway. In first case above (#1) most of the deviations were in the same direction and so they were accumulative making the problem progressively worse. The best case scenario would be if dimensional deviations off-set and cancel out each other. However, that is a lot to wish for. You may ask now, “What is the moral of this story?” Well, the moral of this story is “keep things in proper perspective.” Consider the whole story, the whole picture, and the whole process from the striving for design perfection in the office, to the stark realities of the final constructed plant.